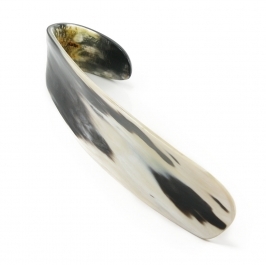 home » shoe horns » Shoe Horn with Hook End 7"
This is a beautiful handmade Shoe Horn, made from cattle Horn (Ox horn) and Highly Polished. it is approx. 7 inches length (17cm). Buyer please note: shoe horns are natural product, they are unique in colour. The item you receive may differ from the pictured image, (No two are the same).